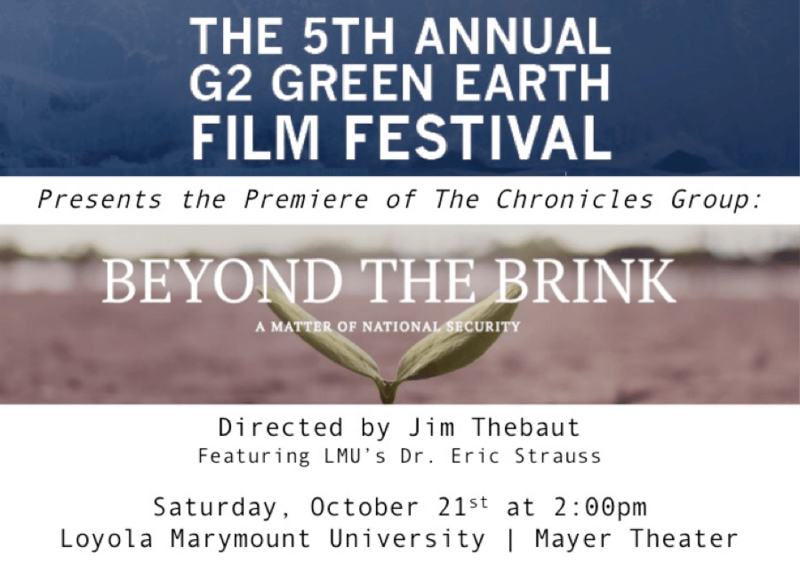 The fifth annual G2 Green Earth Film Festival is this weekend, October 20-22, at LMU’s Mayer Theater, co-sponsored by The G2 Gallery, CURes, and LMU’s School of Film and Television. There will be 18 documentaries screened over the course of the three days, accompanied by expert panel discussions, receptions, and more. Each day has its own theme: “Common Bond” presents films highlighting the human-animal bond, “Getting Current” features films addressing the water crisis, and “Green City,” which focuses on the intersection between humans and nature in urban settings. The festival offers the opportunity for individuals to learn more about current environmental issues and their widespread impacts. On Saturday, October 21, there will also be a special premiere of Jim Thebaut’s film “Beyond the Brink,” which presents a future world that no longer supplies enough food or water to sustain its inhabitants. The film focuses on California’s San Joaquin Valley and the ever-increasing difficulties for farmers and the local produce industry due to drought and water scarcity. “Beyond the Brink” also features LMU’s own Dr. Eric Strauss, Executive Director of CURes. The film will be screened at 2pm with a panel discussion immediately following. The festival is free to attend, but registration is recommended. Additionally, donations will be accepted for The Bay Foundation’s Farm to Table Composting program, Heal the Bay, and Voice for the Animals. Make sure not to miss this fun and educational event!